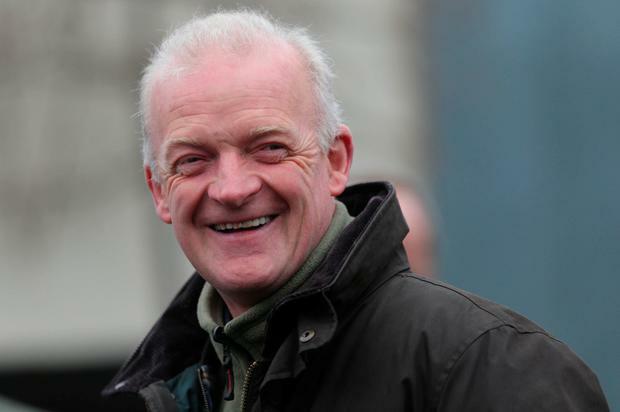 Willie Mullins supplies four of the 13 runners in Wednesday's Coral Punchestown Gold Cup on day two of the Festival meeting. Mullins pitches Killultagh Vic, Bellshill, Djakadam and Total Recall, who ran in the Grand National last week, into battle while his trainer's title rival Gordon Elliott relies on Outlander. Edwulf takes his chance for Joseph O'Brien, Noel Meade runs Road To Respect, while Henry de Bromhead's Sub Liuetenant and Colin Tizzard's Sizing Granite also line up. Tizzard's Kilbricken Storm will aim to follow up his Albert Bartlett win at Cheltenham in the three-mile Irish Daily Mirror Novice Hurdle. Mullins takes him on with Next Destination, Ballyward and Brahma Bull while Elliott runs Blow By Blow, Delta Work and Lackaneen Leader among 11 runners. The Racing Post Champion Bumper is also dominated by Mullins with the champion trainer saddling four of the 10 contenders. Blackbow, Carefully Selected, Tornado Flyer and Cheltenham winner Relegate give him a strong hand, but Elliott runs Felix Desjy, Getaway John and Rapid Escape. Tom Lacey sends over Dorking Boy.